A tick’s life cycle goes through a number of life stages before its life comes to an end. From the first stage of a tick’s life cycle the egg to which a female tick lays thousands in number, comes the new hatchlings called the tick larvae. This stage is also known as seed tick. This stage is the smallest form of ticks which has the size of about 0.5mm or about 1/32 or 1/8 of an inch, and may even be smaller than a poppy seed. This second stage form of tick comes out with six legs. 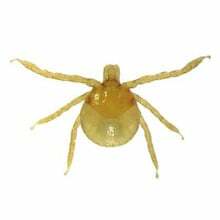 Despite lacking a set of legs, it still looks very similar to the adult ticks which however have eight legs. Ticks need blood as their source of energy in order to grow into their next stage of life, develop and reproduce as adults. Among the tick’s life stages, the tick larvae get the first chance to feed on blood. Seed ticks have preferred blood hosts, except for a few tick species. Its first animal hosts are usually the small ones, like small mammals and reptiles. These potential hosts may be small rodents, lizards and birds. Ticks have no capability of jumping and so they utilize plants to go to a certain level where they can attach to their potential hosts that happen to pass through. They are able to detect their very first blood hosts through the technique called “questing”. This technique allows the tick larvae to become alerted of raising carbon dioxide levels released by the animals. These seed ticks are usually seen by the thousands in house pets such as dogs. Once these ticks have a full blood meal, their bodies expand much like a balloon, they become rounder and bigger. After taking its blood meal for several days, they detach from their host and drop to the ground then digest their blood meal and then grow into their next stage of life. They begin to shed their skin, a process called “molting” to grow into the next stage which is the nymph. While tick bites are known to be hazardous to health due to the fact that they transmit diseases, tick larvae however are not born infected. They only become infected when they feed on infected animals, which are called the “reservoirs”. This stage of tick is not able to transmit diseases to animals and humans. They may get infected after feeding on infected animals but after a full meal, it will no longer look for another host or human to feed on – this explains as to why specifically tick larvae does not transmit diseases nor are health threats to both animals and humans.